The information on this website supersedes other references. �In case of ambiguity this information will be considered authoritative and final. Science Knights is a science fair; gathering students to demonstrate their individual science projects in a competitive environment. 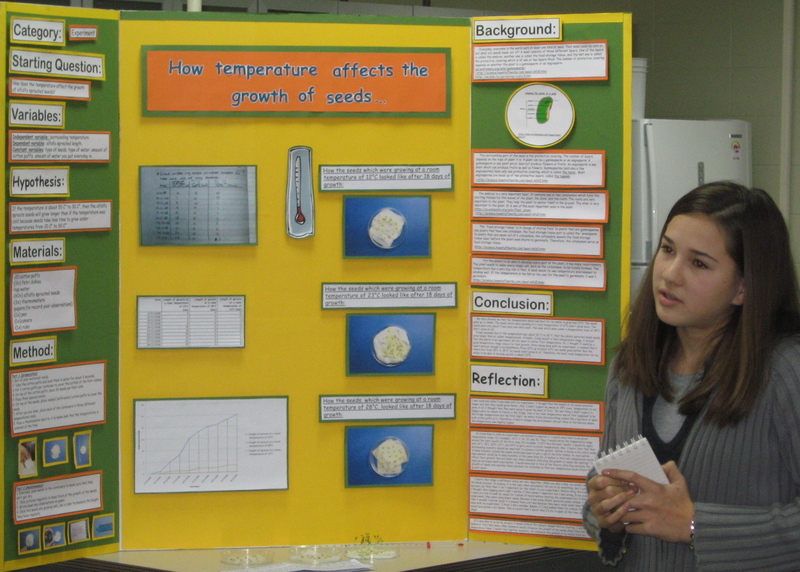 Above: Jade Lebailly (grade 8, 2008) explains her experiment: "The Affect of Temperature on Bean Seed Germination." *Note: academic performance is not dependent on, nor related to, a students success in the the competition. Who?��This is a mandatory event for all GSIS students in grade 6-8. What?��In an open house format, student present displays and project to parents & visitors. �Judges also patrol the event, interviewing students, observing their presentations and scoring their quality. When?�Student may enter the auditorium from 6:30 pm and later and have 30 minutes to set up their projects. �Doors will open to visitors at 6:30 pm.